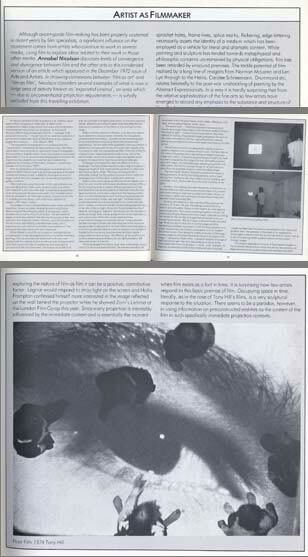 Annabel Nicolson on film as film, including the early films of William Raban, in an article from Art and Artists, 1972. Although avant-garde film-making has been properly sustained in recent years by film specialists, a significant influence on the movement comes from artists who continue to work in several media, using film to explore ideas related to their work in those other media. Annabel Nicolson discusses levels of convergence an d divergence between film and the other arts in this condensed version of an article which appeared in the December 1972 issue of Arts and Artists. In drawing connexions between 'film as art' and film as film' Nicolson considers several examples of what is now a large area of activity known as 'expanded cinema', an area which - due to unconventional projection requirements - is wholly excluded from this travelling exhibition. Distinct from film makers with a fluent, organic approach to their material and an awareness of its structural implications area number of artists using film primarily to deal with concerns arising out of other work. Of these only a handful treat film as an essentially plastic medium. It may seem tenuous to distinguish between artists and film makers, many of whom come from a background in painting i.e. Le Grice, Drummond, Gidal etc., but the use of film as an expedient for demonstrating concepts is diametrically opposite from structural use of film and still more so from the perceptual and psychological exploration identified with Personal film makers. The apparent tightness of approach of certain artists' films is less to do with any commitment to the inherent structure of the medium than with a consistent adherence to concept and method generally. Recurrent artistic concerns with subject/object duality and the reciprocity of process and content has determined a two screen format for several artists' films i.e. Dan Graham, David Dye, David Askevold, John Hilliard etc, which is clearly different from multi-screen work as a projection expanded event i.e. Malcolm Le Grice, Carolee Schneemann, Tony Conrad, Paul Sharits etc. The self-referential nature of much conceptual art provides an referential treatment parallel with the materially analytic, self-referential treatment of film-makers such as the Heins in Germany, Landow and Sharits in the States, Le Grice, Gidal, Drummond etc, in England. What may appear didactic concern with the chemistry of the medium is an essential landmark in an overdue, radical re-examination of the nature of the film. The explicit showing of sprocket holes, frame lines, splice marks, flickering, edge lettering necessarily asserts the identity of a medium which has been employed as a vehicle for literal and dramatic content. While painting and sculpture has tended towards metaphysical and philosophic concerns unrestrained by physical obligations, film has been retarded by unsound premises. The tactile potential of film realised by a long line of imagists from Norman McLaren and Len Lye through to the Hems, Carolee Schneemann, Drummond etc, relates belatedly to the post-war unshackling of painting by the Abstract Expressionists. In a way it is hardly surprising that from the relative sophistication of the fine arts so few artists have emerged to accord any emphasis to the substance and structure of film. But by-passing this development and using film as documentation for concepts is inappropriate and ultimately negates the potential of film yet again. The lack of cross reference between artist's and film makers' films is disheartening since these polarities of conceptual and perceptual emphasis could throw illuminating perspectives on each other. The London Film Makers' Co-operative distributes virtually all the films which treat film as film, European and American, but artists' films are often inaccessible except during exhibitions at the few galleries that handle film and/or video such as Situation, the Lisson, Nigel Greenwood, Jack Wendler and occasionally the Tate and the Hayward. Timing problems tend to arise since the films are only projected when a reasonable number of people are present or at unadvertised times. The diagrams and lucid texts providing concise, conceptual accounts can be adequate indications of the artistic premise but do not succeed as substitutes for the spectator experience. The Prospect show of artists' films and video tapes, originally staged in the Kunsthalle in Dusseldorf in October 1971, was probably the largest single collection of such work together at one moment, yet no gallery in Britain arranged to show it during the tour of Europe, Japan and U.S.A. Many of the artists concerned have shown work in London this year viz, Dan Graham, Jan Dibbets, William Wegman, Klaus Rinke etc, but the relevance of seeing the whole show collectively would have been timely. Obviously artists' films should be more readily available but the alienation of distribution through existing outlets and unsuitable projection conditions are as unattractive to artists as to any discerning independent film maker. The inaccessibility of so much material slows down familiarity with the language of film. Art colleges on the whole are playing an insufficient part in expanding an awareness of treating film as film. It's still common to find film equipment confined to graphics departments specifically for animation and advertising purposes while fine art students have to ease their way a, or work independently on borrowed equipment without informed feedback from tutors. College authorities prevaricate by saying that the cost of film making is prohibitive yet the possibilities of using film and video economically and pooling resources between several neighbouring art colleges have scarcely been tapped. For artists gravitating towards film from a conceptual or minimal background there is a reluctance to handle technical aspects of film making and the implied concern with material. Jan Dibbets in Holland employs technicians to handle the stage in between his concept and the realisation of it on the screen. Other artists such as Dan Graham and David Askevold work mainly on super 8 and make use of cassette tape recorders. Flexibility in the camerawork is limited to where it is strictly integra to the concept of the film i.e. single framing throughout John Latham's 'Encyclopaedia Brittanica', one frame per page. John Hilliard has used standard 8mm film, unsplit, for projection on two 16mm projectors but specifically to obviate the necessity of ever having four projectors together at once. All these artists employ a methodical approach which determines an avoidance of plastic possibilities of film. There is no point of contact with Paul Sharits' tenet: 'I wish to abandon imitation and illusion and enter directly the higher drama of celluloid, two dimensional strips; individual rectangular frames: the nature of sprockets and tension; projector operations; the three dimensional light beam; environmental illumination; the two dimensional reflective screen surface; the retinal screen; optic nerve and individual psycho-physical properties of consciousness. In this cinema drama, light is energy rather than a tool for the representation of non filmic objects; light, as energy, is released to create its own objects, shapes and textures. Given the fact of retinal inertia and the flickering shutter mechanism of film projection, one may generate virtual forms, create actual motion (rather than illustrate it), build actual colour-space (rather than picture it), and be involved in actual time (immediate presence)'. Similarly, diversity in projection is used only when it is a logical outcome of concerns within the film. Subject/object pre-occupations and questions of orientation have determined twin-screen projection for Dan Graham's film Two Correlated Rotations in which two cameramen spiral counter directionally, one walking inwards, the other outwards, simultaneously filming each other. It is shown on two walls at right angles to each other. Askevold's three camera film in which three moving instamatics are the subject and object each other's viewfinders is designed for triple screen projection. Another of his films is for projection on four sides of a pillar so that the spectator never sees all sides at once. David Dye is probably the only artist who consistently rejects the use of film as a retrospective reality referring to another time/space by initiating specific projection situations for each film for dialectic between image, process and content. Confine is a short film zooming in on a photo of himself. When projecting he walks towards the screen with the projector, thus decreasing the image area, while the projected photograph scale apparently remains constant within a given rectangle. The activity of walking towards the photo while filming is compensated by the action of walking towards the screen when projecting, the two activities thus being mutually dependent. This haptic use of camera end projector (a term used in psychology meaning empathy rather than spectator detachment), is a radical divergence from conventional acceptance of projection as the relaying or an earlier completed activity. Tony Hill's film, mostly shot from above, is projected onto the floor of the audience cubicle, via a mirror on the ceiling. One is physically confined and in contact with the screen/image, walk on clouds, water, fire. One's own sense of scale and weight is transformed in this intensely physical situation. A later work involved the audience crawling through a tunnel and up onto a glass floor through which images we projected from below. Through the opaque surface (tracing paper is stretched beneath the gloss), under one's feet, one sees images of figures crawling or clinging to the lower side of the gloss. This elaboration on the projection situation, in that it is physical and spatial, has certain links with the live, expanded cinema events of Carolee Schneemann, Vallie Export, Malcolm Le Grice and others. There is a fundamental difference in that Tony Hill's films rely on on earlier drama external to the camera rather than initiating the drama in the film process. The image content dictates the spectator experience en as much as the environmental framework, but the nature of the controlled spaces for two and three people at a time keeps the experience particularly immediate. Chance has no relevance for film used as concept but for those exploring the nature of film as film it can be a positive, contributive factor. Legrice would respond to stray light on the screen and Hollis Frampton confessed himself more interested in the image reflected on the wall behind the projector when be showed Zorn's Lemma at the London Film Co-op this year. Since every projection is inevitably influenced by the immediate context and is essentially the moment when film exists as a fact in time, it is surprising how few artists respond to this basic premise of film. Occupying space in time, literally, as in the case of Tony Hill's films, is very sculptural response to the situation. There seems to be a paradox, however, in using information on preconstructed realities as the content of the film in such specifically immediate projection contexts. An obvious attraction of film to sculptors is 'its inherent use of space without occupying it' (Askevold). A dislike of the cumbersome in object sculpture and its intrusion into limited space had already led many artists into temporary, environmental situations before using photography and film. 'I no longer make permanent structures- though most of my work has a potential of permanence if specifically required (distribution of my products is largely documentary)' . . John Hilliard 1969. From on appreciation of the photograph as an extension of a sculptural reality Hilliard made a series of photographs of the object covered with photos of itself, a distinctly critical gesture since his larger work at that time was seen only via framed photographs in gallery situations. William Raban's use of film as a means of investigating time and perception of time developed directly from his earlier time-lapse paintings, Canvas stretched over a tree trunk with wire, was overlaid with thin washes of point at intervals over a long period of time. Each successive stage of weathering, bark printing and corrosion from the wire was noted. The analysis of the affects of time, by controlled time-lapse experiments, would have interested Monet, whose Rouen Cathedral series must have been the first continuous investigation of the affects of time and light and one subject. Raban's first film, Basement Window, was shot only when a figure passed the window/screen. Similarly, the microphone, situated outside the window, recorded only as someone passed across and acted on a monitoring device that someone was approaching. The time scale of the apparently continuous stream of people thus contrasts with the sky time-scale which rapidly varies-from dawn to dusk. An interesting side effect of this film is that the window/screen shape is slanted towards the top, due to the camera angle, so that the projected image area appears as a irregular rhomboid rather than the conventional rectangle. Subsequent time-lapse films deal with effects of time on landscape. The fixed camera records a single image throughout a designated length of time. Imperceptible variations in colour and light become clearly visible. The drama of racing clouds is predictably striking, but the gradual evolution of form within the landscape, even in a few days, is particularly revealing. Raban's films which juxtapose differing time analogues, such as River Yar and Viewfilm are the most interesting in the use of film as film by providing scales to register different perceptions of time. Both these films incorporate snatches of real time within the time lapse framework, structured in response to the shooting context. River Yar was shot during the autumn and spring equinoxes last year, at one frame a minute, day and right. The fixed camera pointed due South. Sound was recorded at four points each day: dawn, midday, sunset and midnight corresponding proportionately to the ratio of day to night. Along with the anticipated sounds of seabirds, herring gulls, foghorns, wind and so on, the microphone picked up foreign radio waves, giving almost cosmic implications to such a local scene. Within this chosen space and time, environmental changes occurred gratuitously. Local authorities decided overnight to build a sea wall along part of the shore and equally suddenly abandoned it. An area where cows were grazing in the first exceptionally beautiful autumn sequence was completely flooded by the time spring shooting started and then rapidly evaporated one clear morning. The reflection of the camera in the window (closed because of heavy rain at night) provides a self-referential context at intervals. All his landscape films have a visual rarity in the chosen image which Courbet would have admired. The restraint extends to the movement within the static frame: water, reeds, trees, and occasional figures, ducks, cows.... His recent work which incorporates time exposures of twenty seconds per frame intercut with the same material filmed in the pro/actor gate - hovers on a more perceptual, less linear method of working. Fragmented images polarised by filming from the screen are edited in with the original Broadwalk material, setting up a perceptual structure which deals more fluently with film as film. David Dye's filmworks are designed for specific projection contexts integral to the conception of each work. The films refer to the means that produce the image setting up dialectics between image and 'reality'. A projector projects images of itself onto itself, a screen is exposed by the image of its own perimeter projected around its edges, two extended loops operating around the wall direct one to 'see the film moving through A' so that one turns away from the projected image to watch the celluloid itself. The most explicit dialectic film piece consists of two loops on facing projectors, filmed by two facing cameras, with one hand moving from one lens to the other, obscuring and revealing each viewfinder in turn. Each screen thus only exists in relation to the other. Similarly, two cameras document the activity of each other as they are lifted over each other around a prescribed circle, process and content being as reciprocal as subject and object. Shown on two screens it defies one's orientation as does David Askevold's beautiful Three Instamatics film. Working with dialectics in this way David Dye questions the autonomy of illusion. He says 'My feelings towards the filmic medium are ambivalent. Drawn to that medium by what seems a logical progression, from works consisting largely of mirrors, the camera operating by means of a mirror image, I also feel something like nausea for the rich diet of images that served up for our constant consumption. We are living in a camera/image saturated age. What has drawn me to film is not the image and all its expressive possibilities, my concern is with the filmistic situation as a whole, stripped down to its basic components, with its imagistic illusion torn away. From being the unseen producers of the image camera, projector and screen themselves become the object of the image- cameraman faces mirror, a projector projects an image of itself onto that screen. My work also exists of a critique of that other triad of the filmic/art situation - artists, work, spectator negation, a subversion of the artist's traditional role is involved; images are deprived of autonomy, forced back on the means that produce them; the spectator is frustrated of his expectations, encouraged to sea the work not as a framed slice of 'reality', but as a device for posing certain questions about communication through images'. The physical dependence of same of the projected images or the situational elements from which they derive, the realization these elements as the content of the work manifests that other recurrent artistic premise: the content of the work is the process of its realization. In one film the vertical strokes of the word END are marked on the wall. It is completed in the projection of the missing lines. The concrete and the projected are mutually dependent for realization and term ination of their existence. A film loop of the artist writing his signature is projected in focus onto a screen with the middle cut out so that the writing always appears out of focus on the wall behind, while the edges of the page are sharp on the screen. A circle was filmed in close up as it was painted on a wall. With all but a section of the painted circle covered, the filo is projected onto it clockwise, apparently revealing the hidden circle. The most concise David Dye film is circular in projection as well as in concept. He filmed a circle painted around himsellf on the floor. This is superimposed as he revolves in the centre with the projector. The boundary of projected light between artist and spectator defines its own slender existence. An appropriate description to end on is Jan Dibbets' Venetian Blind film. An image of a venetian blind fills the screen. As it slowly opened the audience area becomes brighter. As it closes the film fades out and darkness returns.